We’d love your help. 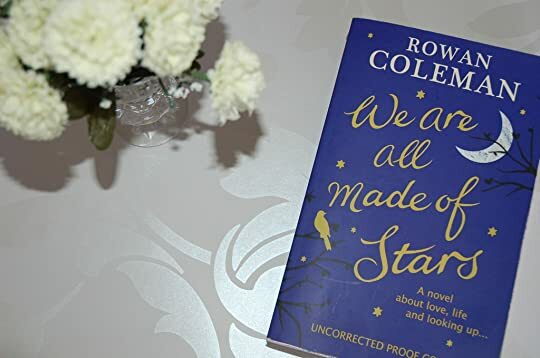 Let us know what’s wrong with this preview of We Are All Made of Stars by Rowan Coleman. What if you had just one chance, one letter you could leave behind for the person you love? Stella Carey has good reason to only work nights at the hospice where she is a nurse. Married to a war veteran who has returned from Afghanistan brutally injured, Stella leaves the house each night as her husband Vincent, locks himself away, unable to sleep due t What if you had just one chance, one letter you could leave behind for the person you love? Stella Carey has good reason to only work nights at the hospice where she is a nurse. Married to a war veteran who has returned from Afghanistan brutally injured, Stella leaves the house each night as her husband Vincent, locks himself away, unable to sleep due to Post Traumatic Stress Disorder. During her nights at the hospice, Stella writes letters for her patients containing their final wishes, thoughts and feelings – from how to use a washing machine, to advice on how to be a good parent – and usually she delivers each letter to the recipient after he or she has died. To ask other readers questions about We Are All Made of Stars, please sign up. You'd expect a book where a hospice takes centre stage, to be extremely depressing. It wasn't, but it WAS incredibly moving, yet also joyous and funny. Stella is a nurse at Marie Francis hospice. She is experiencing marital problems - her husband Vincent is a war veteran who was injured in Afghanistan, and he finds it difficult to come to terms with what happened to his friends and himself. Though she leads a troubled life, Stella takes it upon herself to write letters from patients to their res You'd expect a book where a hospice takes centre stage, to be extremely depressing. It wasn't, but it WAS incredibly moving, yet also joyous and funny. Stella is a nurse at Marie Francis hospice. She is experiencing marital problems - her husband Vincent is a war veteran who was injured in Afghanistan, and he finds it difficult to come to terms with what happened to his friends and himself. Though she leads a troubled life, Stella takes it upon herself to write letters from patients to their respective loved ones. These are the ' final letters ' the ones that range from the mundane' this is how the washer works ' to the secrets and thoughts that were too difficult to say out loud - the ones that are easier written down for both the writer and recipient. This is a beautifully written book with a sense of peace and acceptance, and yes, hope - hope that death is peaceful and painless, and with a level of closure, and also hope that these final letters give the recipients the courage to take those first steps into that unknown future. Just make sure you have plenty of tissues to hand , trust me you'll need them - a real tearjerker! One way is is to write letters to people you love. Or ask your Hospice Nurse to write them for you. all her characters exude authentici I was sobbing! all her characters exude authenticity, warmth, and charm. Love - Life - Death ......Beautifully written! Deeply Moving! Stella used to be a trauma nurse, these days she works nights at the Marie Francis Hospice and Rehabilitation Centre, avoiding time with her husband who is newly returned from fighting in Afghanistan. Her feelings for him have not changed, but he has changed. Try as she might, she can’t “fix” him, and truth be told, it’s the last thing he wants, for her to fix him. Some of the patients at Marie Francis will not be leaving, some will but there are several who are spending their last days there. For these, those who know the end is near, she writes letter for them, usually to be sent after their passing. The words they could never bring themselves to say while alive, or perhaps just a laundry list of “how to run the house now that I’m gone.” Last words immortalized, words to read in sorrow, words to hold onto, words to share why the recipient was worthy of being loved, perhaps. Told from multiple viewpoints, these are, for the most part, the stories of those who Stella comes in contact with, those whose letters she’s written. There are sad stories and happier ones, stories like Hope’s, a young woman who has yet to learn to really live despite her Cystic Fibrosis. All their stories are filled with every emotion you can imagine. The letters, for me, are what raises this story, which is really all of their stories, above being potentially too predictable, or too depressing or even too “sappy” to something more heartfelt and genuine. "If there's one thing I've learnt while I've been working the night shift at Marie Francis it's that this is the one thing that sets us apart from other animals, the one thing that makes us human. Hope." We Are All Made of Stars is the beautifully written and heartfelt story of several characters, all of whom are facing their own fears whilst grasping on to hope that things can get better. Though the synopsis only mentions Stella's story, we see snippets from the point of view of Hugh, a young guy whose girlfriend recently left him leaving nothing behind but her cat, and Hope, a teenager who has long suffered with cystic fibrosis and can't see herself leading a normal life. Then, of course, there is Stella, a nurse at a hospice who spends her time and energy caring for others whilst avoiding facing her own problems at home after her soldier husband returned home from Afghanistan following a terrible accident, resulting in a brutal injury and post traumatic stress. She allows those she cares for at the hospice to leave their final mark on the world by putting pen to paper for them, writing their final words to their loved ones in a letter, and posting them after their death. Whilst seemingly leading different lives, the various characters begin to cross paths and intertwine with each others stories, and when Stella writes a letter that gives her patient a chance at redemption, Stella faces a difficult decision: stick to the rules and hold on to the letter until the time of death, or go against her patient's wishes and deliver the letter whilst there's still time to build bridges? This was the first Rowan Coleman book I've read, and I absolutely adored her writing style. Her perfectly flowing words kept me engaged with every heart-wrenching twist and inspiring turn. There were a few minor typos, but these didn't take away from my enjoyment in the slightest (and my copy was an uncorrected proof copy, so chances are they're all sorted now anyway!). "You are one of those annoying shiny, special people. People who achieve things, who change things. You're one of those people who matter. One of the ones that make life better for the rest of us. Not dust or ashes but one of the stars." Whilst writing a story of immense sadness, Rowan Coleman was able to keep things from becoming too depressing, and actually turned this into an uplifting tale. She managed to create some wonderful, emotionally deep characters, and I became so invested in their relationships, whether they formed before I joined the story or I witnessed them happen chapter by chapter. Sparks leapt from the pages when certain characters interacted and I found myself genuinely caring for their happiness. Dispersed through the chapters were the letters Stella had written for her patients, and they took me on a journey through a wide range of human emotions; I cried, I giggled (if you've read this and I say 'topiary', you probably know which letter I mean!) and I was made to appreciate every loved one in my life just a little bit more. Despite never meeting most of the people who spoke the words in these letters, emotions were stirred every single time, and although the letters made me cry, I was uplifted by the love - familial, friendly and romantic - that leapt from each and every one. "Do not miss me, because I will always be with you... I am the air, the moon, the stars. For we are all made of stars, my beloved... Wherever you look, I will be there." 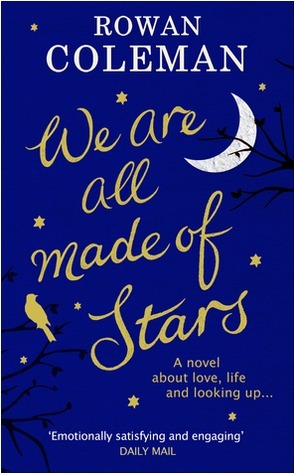 Filled with both heartache and humour, We Are All Made of Stars is an inspiring and moving story which reminds us of the dawn that comes after every dark time. I just finished this book that I could not put down and it is 1:00 am. WOW. The excerpt sucked me in and I feel emotionally spent. Stella is a hospice nurse who works the nightshift. She has made it her duty to write letters, the final words, of her patients. She is also distancing herself from her husband who has returned from Afghanistan, injured and broken. Vincent cannot forgive himself for surviving and does what he can to push Stella away. Stella tends to a new patient who wants her to send I just finished this book that I could not put down and it is 1:00 am. WOW. The excerpt sucked me in and I feel emotionally spent. Stella tends to a new patient who wants her to send a letter to a loved one. The contents of the letter force her to betray her patient and sets in motion a chain of events that can cause more heartbreak. There are a couple of storylines that weave together nicely with Stella as the common thread. She is heartbroken because her husband is a shell of his previous self and her devotion to her patients and her wanting to preserve their final thoughts to loved ones gives her purpose. “I learned that what people say has a thousand times more meaning when it’s written down. Words become immortal, beautiful, personal, heartfelt and special. A letter is a memory that will never be lost, will never fade or be forgotten.” Stella. Stella is a nurse who is currently working the night shift at Marie Francis Community Hospice and Rehabilitation Center. She is a caring, selfless woman who goes beyond her nursing responsibilities by writing letters for patients approaching death to someo “I learned that what people say has a thousand times more meaning when it’s written down. Words become immortal, beautiful, personal, heartfelt and special. A letter is a memory that will never be lost, will never fade or be forgotten.” Stella. Stella is a nurse who is currently working the night shift at Marie Francis Community Hospice and Rehabilitation Center. She is a caring, selfless woman who goes beyond her nursing responsibilities by writing letters for patients approaching death to someone in their lives, framing special moments. Like other books I have read such as “Letters from Skye” by Jessica Brockmole in which letters are central in capturing people’s spirit this is what stood out for me. Don’t get me wrong; there was strength in all featured characters that have dedicated chapters laid out in this ‘7-night’ book. Their struggles and relationships were meaty. However, I think the letters took this book to a higher level. Stella is my favorite and a hero, a woman of strength and character. She is someone who is around sadness at work and in her private life. Stella chose to work night shift, as her life with her husband began to unravel. Her husband has been in a very dark place for months after returning from war having lost his leg and best friend. This book is beautifully sad and it’s a real life changer. I will definitely not only be buying it but reading it at least 9 more times. Such a heartfelt gut wrenching cosy book ❤.i am in love with this author. Such a heartfelt gut wrenching cosy book ❤️.i am in love with this author. Gosh! If this doesn't pull at your heartstrings, I doubt anything will. What a heartbreakingly beautiful story of love, loss, life, and the truly compassionate and incredibly strong side of human nature. Remember to never give up and always value those you love. Anyone who enjoys emotional stories with very real feeling characters needs to read this book! I am going to be a grumpy voice among the deafening choir of sobbing, clamouring and entreating fans of this pretty little piece of fiction titled, "We Are All Made Of Stars". Yes, it is pretty. The cover art shows Ursa Major and Minor, the distinctive "W" of Cassiopeia and tenderly tucked beside the title, twinkles the outline of another "constellation" - a heart- among the stars. This is fiction for those who have never lost their hearts to death, to the utter sadness and despair of terminal i I am going to be a grumpy voice among the deafening choir of sobbing, clamouring and entreating fans of this pretty little piece of fiction titled, "We Are All Made Of Stars". Yes, it is pretty. The cover art shows Ursa Major and Minor, the distinctive "W" of Cassiopeia and tenderly tucked beside the title, twinkles the outline of another "constellation" - a heart- among the stars. This is fiction for those who have never lost their hearts to death, to the utter sadness and despair of terminal illness and desperate chronic illness. This is the movie with the letters written by the trauma nurse Stella (whose name, oh dear me, means, "star") and the words of those letters which the author thinks the dying may give as gifts for the living, in their memory. This is the Romance, the starting over for the soldier husband of Stella and, yes, the Cystic Fibrosis patient Hope, determined to live in the present joyfully. Hope saw dying Issy want to have a life ahead of her, and write a letter to her mom, encouraging her. And, you see, just look up and there we are... in the stars. It is a pretty fiction, like a Jojo Moyes story. It speaks of love and closure, of the dying growing aware and the living moving on. It speaks to the ideal, to the best of humanity. Rowan Coleman has written a touchy, feely, mushy emotional bomb of a book, but it is pure fiction. Fairy tale but it is about death. I am the grumpy warning voice here. A letter may be a dagger, although it could seem to be a charm. A dying woman can be bitter to her last breath. And tender endings lead to raw grief, which may never really end. Wish for stars. We may all be made of stars, but our final performance may not be outstanding. We Are All Made of Stars follows the lives of three people: Stella, a hospice nurse whose husband has recently returned from Afghanistan with physical, mental and emotional injuries, Hope, a young woman with cystic fibrosis who is staying in the hospice to recuperate after a close brush with death, and Hugh, a nearly middle-aged historian whose consistent - and boring - life is interrupted when a single mother moves next door. Throughout the book, Stella writes final letters for patients who do We Are All Made of Stars follows the lives of three people: Stella, a hospice nurse whose husband has recently returned from Afghanistan with physical, mental and emotional injuries, Hope, a young woman with cystic fibrosis who is staying in the hospice to recuperate after a close brush with death, and Hugh, a nearly middle-aged historian whose consistent - and boring - life is interrupted when a single mother moves next door. Throughout the book, Stella writes final letters for patients who do not have much longer to live but want to leave something for the people they have cared about. Stella promises to not mail any of the letters until after the death of her patients, but she isn't so sure she can keep that promise when a patient reveals a deeply buried secret that could hurt too much to discover until after that patient's death. Stella is also dealing with her own tragedy at home; since returning from Afghanistan, her husband can barely look at her and Stella doesn't know how to make him better. She desperately loves her husband but is almost sure she will soon lose him. Hope has lived her entire life being afraid to actually live. Having cystic fibrosis, she has lived under the constant fear of catching some seemingly harmless bacteria that her body will decide is just too much. Ben is her closest companion and soon to be partner in crime - because what is the point of living if you can't really live? Hugh has lived the majority of his adult life avoiding making close connections with people. His mother took her own life when he was ten and his father died when Hugh was a young adult. If you never get close to people, they can never hurt you or leave you. Right? Hugh is startled to find a young child on the neighboring house's doorstep one cold evening and tries to go about making sure the boy is okay - because after all, that is what his own father would have done. And he wants to be like his father. What he doesn't count on is becoming attached to the boy and his mother. While I did enjoy the majority of this book very much, it was honestly too predictable. There were a lot of heartfelt moments and most definitely emotional journeys, but I kind of wanted it to be a bit more emotional in the end than what it was. Everything turned out pretty much exactly as I expected. That is both a positive and a negative I suppose since I got the ending I wanted but was absolutely surprised by nothing. I also found it fairly unbelievable that in a place where the majority of people are on the brink of death anyone who even mentions the possibility of something existing afterwards comes to the conclusion that there simply is no God. I could understand a few of the characters being atheist or agnostic, but all of them? Although I have no idea whether she is or not, it felt more like the personal belief of the author. This lovely book was everything I thought it would be and just what I needed. I have been reading so much that has left me disheartened and weighed down by my own cynicism and gloom but this book was a gentle reminder of what is true and most important … and most of all, it reminded me of the innate kindness of human beings (or at least SOME of them). I love epistolary stories. I know it's hopelessly old fashioned and certainly low-tech in this age of text messages and email but there is somethi This lovely book was everything I thought it would be and just what I needed. I have been reading so much that has left me disheartened and weighed down by my own cynicism and gloom but this book was a gentle reminder of what is true and most important … and most of all, it reminded me of the innate kindness of human beings (or at least SOME of them). I love epistolary stories. I know it's hopelessly old fashioned and certainly low-tech in this age of text messages and email but there is something so uplifting about receiving a hand-written letter from someone you love. It's PERSONAL.. and you can imagine that the person put time into thinking about each and every word that was written and these thoughts come from not only the mind but the heart. This story, 'We Are All Made of Stars' centers around such letters. Stella Carey is a hospice worker at Marie Francis Community Hospice and Rehabilitation Center and she spends her nights writing letters for her dying patients…. letters which she promises to deliver to loved ones after her patients's deaths. Stella loves these letters… "What people say has a thousand times more meaning when it is written down. On the page, the words become immortal, beautiful, personal, heartfelt, special. They are words that will always be there to read again and again……". Yes, the letters are often a final goodbye and an assurance of the love that existed between patients and loved ones. But what struck me was how often the letters were also about simple day-to-day things.. advice on mundane household chores or parenting advice. I thought a great deal about those letters. Initially, it seemed odd to me that a dying person would choose to focus on such seemingly unimportant things but then I realized that it made a lot of sense. When a person is relied on and depended upon to keep their loved ones' lives running smoothly, that death would be not only painful for the loved ones but would increase the chaos experienced. For that dying person, the ultimate expression of love would be to try to lessen the chaos created as much as they possibly could. After all, death is always hardest on the people left behind. There are three narrators in this story. Stella, of course, is one. Stella works the night shift at the hospice so that she can avoid being at home while her husband Vincent is there. Stella and Vincent's marriage is shaky… in fact, is is nearing collapse. Vincent has come home from war… physically, emotionally and spiritually broken; and Stella's greatest pain is that she is helpless to heal this man that she loves so much. She is hurt that Vincent can't seem to bear to look at her. He can't sleep and he lies for hours with rock music blaring to try to block out the thoughts and images he can't figure out how to live with. There is a cruel irony to Stella and Vincent's story… Stella believes she is somehow at fault for Vincent's pain; but Vincent can't bring himself to tell his wife that he hates himself for not being the man he used to be. But Stella only sees that young man she first met and fell in love with in her mind's eye. The two can't seem to find a way to bridge this gap and make their way toward each other.. so Stella pours her anguish into trying to help her dying patients. One of Stella's patients is a 21 year-old woman named Hope and she is the second narrator in this story. Hope has cystic fibrosis and is recovering from a severe infection at the rehab center. The infection almost ended her life and she spends her hours obsessing about where she was when the bacteria which made her so ill first entered her body. Hope has spent her 21 years with the specter of death looming over her shoulder. She never knew when the infection would arrive which would cut her life short. So she hides herself away designing book covers and reading voraciously .. reading to transport herself into other people's lives. The problem for Hope is that she is so busy obsessing on her death that she hasn't been living her life. The third narrator in this wonderful story is Hugh and I have to admit that Hugh, at first, doesn't seem to fit into the direction the story is taking. But eventually the details are revealed and the pieces come together nicely. Hugh is a rather eccentric character who lives alone with his rather unusual cat named Jake. Hugh is not quite middle-aged but he has lost his family.. both of his parents are dead. His mother committed suicide when he was a young boy and his father died not so long ago. Hugh was a reminder to me that it doesn't matter how old you are when you lose your parents… you ALWAYS feel like an orphan. Hugh has shut himself away because it is easier and safer to not let anyone close to him. After all, if he doesn't CARE about anyone, then he doesn't have to experience the loss of losing them when he is ultimately left alone. What Hugh DOESN'T know is that he is about to meet someone (more than ONE someone!) who will change his life. The beauty of this story is that although it seems that there are several different and unconnected stories playing out, these characters are all connected in the end in a way that is greatly satisfying. Each chapter begins with a letter.. words from the heart of a dying person. These letters were all a reminder to me that there is a simple truth that runs through everyone's lives… beneath all of our worries, fears and obsessions about all the trivial things which occur from day-to-day… what matters in the end are our connections that we forge with other human beings. These connections endure long after we are gone from the world. As one dying patient so eloquently wrote to his beloved… "Do not miss me, because I will always be with you. In every drop of rain that touches your tongue; in every breath you inhale.. I will be there in every moment. I am not gone, I am only altered , from this state of matter to another. For a moment, for too brief a moment, I was the man that loved you, but now that I am changed, I am the air, the moon, the stars. For we are all made of stars, my beloved." This is a book where you just... *sigh* when you've finished it. I loved the book. Have been near to tears at various points. It's full of feelings and love. It's highly unique with all the letters in between. It's so inspiring to read what a person would tell a loved one when he/she died. A great feel-good story including the not-feeling-so-good parts. I rushed through by the way, finished it within a day. The letters in this book are unique and thi This is a book where you just... *sigh* when you've finished it. I loved the book. Have been near to tears at various points. It's full of feelings and love. It's highly unique with all the letters in between. It's so inspiring to read what a person would tell a loved one when he/she died. A great feel-good story including the not-feeling-so-good parts. I rushed through by the way, finished it within a day. The letters in this book are unique and this book is definitely an emotional rollercoaster ride. I totally recommend this book if you like romance, fiction, and allthefeelz. ...what people say has a thousand times more meaning when it's written down. On the page, the words become immortal, beautiful, personal, heartfelt, special. They are words that will always be there, to be read again and again, and again. A letter is a memory that will never be lost, will never fade, or be forgotten. ‘We Are All Made of Stars’ follows the stories of a group of people whose lives revolve in and around a hospice and respite centre in London. We meet Stella, a night nurse in the hospice with a troubled marriage. To avoid the problems at home Stella has committed to taking the long and lonely night shifts at the hospice and she transcribes letters for the dying to give to the ones they love after they are deceased. Her husband is Vincent; a soldier returned home injured from war who is struggling with survivor’s guilt. Then there’s Hope, a 21 year old girl with cystic fibrosis who is there for respite after battling yet another life threatening infection. Hope is afraid of dying young and not leaving her mark on the world and therefore has a very gloomy outlook on life. We meet her best friend Ben who tries his best to encourage Hope to live her life and have fun; he is unwavering in his friendship. Issy is a fourteen year old girl with terminal cancer who is spending her dying days in the hospice centre. Her mother Thea rarely leaves her side. Issy spends her days worrying about her mum, and Thea spends her days worrying about Issy. And lastly we meet Hugh, his cat Jake, and his new next door neighbours, Sarah and her son who try to warm his cold-hearted indifference towards life. Over the course of seven nights we see how these lives are all interconnected and how the saddest and most difficult moments in life can bring people together. Do you ever begin to feel that you have read too many books by the same author? I’m beginning to feel that way about Rowan Coleman I fear. There was nothing wrong with this book. It was a perfectly lovely read. It was heartfelt, it was touching, I cried at the sad moments and there were plenty of sad moments….but I fear that I have read all this before. It really reminded me of the last Rowan Coleman novel I read, The Memory Book….that time the emotive subject was Alzheimer’s disease whereas this time it is palliative care…. This book was interspersed with handwritten letters that were supposedly transcribed by Stella the nurse for patients of the hospice who were too weak or frail to write themselves. These letters for their families and friends ranged from funny to heart breaking and I will admit that I laughed and cried at all the opportune moments…. However in The Memory Book Rowan Coleman used a similar plot-device; that time between chapters there were handwritten journal entries of memories to help the Alzheimer’s patient remember her life….. So I do feel that even though this was all nicely written and very emotive …. I’ve just seen it all before so it felt old…. Also while being a lovely story there was nothing fresh about it. The plot moved along nicely but it was all very predictable, there were no great twists or surprises. However, there were some lovely moments between Hope and Ben especially. They had a lovely relationship with plenty of banter and bittersweet moments, and they were my favourite characters in the book. ‘And I hate it when you do this' I say. And just like that he's won. We Are All Made of Stars is an exceptional, beautifully-written, heartrending book that will stay with me for a very long time. Hugely moving - it made me want to wrap my arms around those I love and never let them go - and yet imbued with hope and life, it's the most incredible read. I felt bereft when it ended. Een prachtig verhaal deze las ik met een lach en een traan. Dit verhaal zal ik niet snel vergeten. Op het blog van Rachelleest.nl staat een mooie recensie van het boek twintig regels liefde geschreven. A beautiful, moving story of hope, love, dedication and the strength of the human spirit. Stella is a nurse at the Marie Francis Hospice and Rehabilitation Center, caring for those living out their last days. She writes letters for them to those they love expressing their final thoughts and desires. These letters, which appear between chapters, give an extra depth to the story. The focus of the novel though are Stella,along with Hope, a 21 year old afflicted with Cystic Fibrosis, and Hugh, a lon A beautiful, moving story of hope, love, dedication and the strength of the human spirit. Stella is a nurse at the Marie Francis Hospice and Rehabilitation Center, caring for those living out their last days. She writes letters for them to those they love expressing their final thoughts and desires. These letters, which appear between chapters, give an extra depth to the story. The focus of the novel though are Stella,along with Hope, a 21 year old afflicted with Cystic Fibrosis, and Hugh, a lonely man who never quite reconciled with the deaths of his parents. While Stella is confident in her care for her patients, she is struggling to connect with her husband, Vincent, who was seriously wounded in Afghanistan. Vincent is angry and defensive and Stella's attempts to be the couple they once were are failing miserably. Can they find a path to love one another again? Hope, at Marie Francis recuperating from an infection that almost took her life, is trying to figure out a way to fully live her life, despite the limitations put upon her by her disease. Helping her to navigate is her loveable side kick, Ben, whom I found to be adorable. Can Hope let go of her fears? Hugh believed he was content with his life, until his new neighbor awakens new possibilities for his future. When Hugh receives a letter written by Stella for one of her patients, does he have the courage to face the hurts of his past and find the healing he has been seeking? The book is a combination of heartache, humor and thoughtful reminders of the value of life. 4/5. At first it felt like a typical chicklit book, but it turned out to be quite wonderful! Rowan Coleman you have made me cry, again! Followers of my blog will know that The Memory Book was one of my Top 10 reads of last year and now Rowan has written another emotional story which will tug at your heart strings. The main character is ex-trauma nurse, Stella, who works nights at the Marie Francis Hospice and Rehabilitation Centre. She works nights so that she and her former soldier husband Vincent can mostly avoid each other. Stella looks at Vincent with love. Vincent looks at Stella an Rowan Coleman you have made me cry, again! Followers of my blog will know that The Memory Book was one of my Top 10 reads of last year and now Rowan has written another emotional story which will tug at your heart strings. The main character is ex-trauma nurse, Stella, who works nights at the Marie Francis Hospice and Rehabilitation Centre. She works nights so that she and her former soldier husband Vincent can mostly avoid each other. Stella looks at Vincent with love. Vincent looks at Stella and hates himself. He has returned from Afghanistan a broken man – both physically and mentally and even Stella’s love can’t bring back the man he used to be. One of the kindnesses that Stella carries out for her patients is letter writing. She puts those poignant last words in a letter to their loved ones and promises to post it once they have passed. One of the many joys of this story are the letters separating each chapter. We never know who the people are but each letter tells its own story of sadness and humour – from a declaration of love to instructions on how to do the washing and where the life insurance policy is kept. Even though I am guilty of preferring to send an email rather than sitting down and penning a letter, there is no doubt of the pleasure and comfort that a letter can bring to the recipient. The story is told from several viewpoints and even those patients who we meet only briefly, such as teenager Issy and her mother Thea, make their presence felt. Besides Stella, the other main character is Hope - one of the young patients in for respite care. She has Cystic Fibrosis and when we first meet her, she has fought off a severe infection from which she nearly died. Having faced death and won, she must decide how to make best use of however much of her life she may have left. The scenes with Hope and her best friend Ben were charming, even if sometimes the misunderstandings between them were a little frustrating. There were two characters that I had a really soft spot for. One was Stella, and the other was Hugh. Hugh lives alone with a cat called Jake (- a cat who appears to have multiple personalities). He is a museum curator and lives a very solitary existence, unaware of the impact that the arrival of new neighbours will have on his life. At first he seemed to be a random character but as the story progresses his role becomes clear and it was actually the scenes with Hugh that made me cry the most. Rowan Coleman has seamlessly weaved together a diverse set of characters to form a tender and uplifting story. The setting of a hospice does make this an emotional read, but it's certainly not a depressing one. It's a beautifully written story told with love and care relying on the sharpness of the dialogue and some of the wonderful letters for a much appreciated humorous touch (one of my particular favourites was from a 91 year old advising her newly born great-granddaughter). A very gentle tale of seizing second chances and fighting for those that you love, this was another 5* read for me and another sure fire success for Rowan Coleman. I have had this book for sometime and decided to take it on holiday with me and I am glad I did. I loved this book and the characters and story. Beautifully written and glad this was my first with this author. This was beautifully written. The author definitely has a way with words. This book contained different stories, all dealing with some kind of death. The stories didn't start out being that different. So for me, it was a tad too slow to start. I just wasn't drawn into it, but I stayed with it because I was loving the writing. I'm glad I hung in there, the ending was worth the wait. It was definitely sweet, complete with a big fat red bow. Usually that is a negative for me, but it seemed to work This was beautifully written. The author definitely has a way with words. This book was so good! The plot was really touching and the writing style definitely helped realising that. Also, I shed a few tears while reading this book, so definitely don't read this book during your commute (like I did..). Reading real books, and writing real letters; these are two things that I have spent my life doing. Some days I am glad that I am older, and that I probably won't be around when real books and actual letters that arrive in the post disappear altogether. Rowan Coleman has captured, within this story, the emotions that are instilled when a hand-written letter is received, the joy of receiving, the recognition of the time and effort spent on the writing and the ability to keep the letter for ever, Reading real books, and writing real letters; these are two things that I have spent my life doing. Some days I am glad that I am older, and that I probably won't be around when real books and actual letters that arrive in the post disappear altogether. Rowan Coleman has captured, within this story, the emotions that are instilled when a hand-written letter is received, the joy of receiving, the recognition of the time and effort spent on the writing and the ability to keep the letter for ever, and to cherish it when the sender may no longer be around. The story is told in a relatively simple way, with multiple viewpoints. We are introduced to patients in the Marie Francis hospice, and to Stella, the nurse who cares for them during the long, lonely nights. Stella is the letter writer, or the enabler. The patients can share their secrets, their sorrows, their advice and their love, in their own words, Stella will write the letter and promises to post them when the sender has died. Stella herself has lots to deal with. She loves her husband Vincent so much, she looks at him and sees the funny, strong, brave soldier that she married. Vincent looks at himself and sees a man who is no longer complete, he looks at himself and feels guilt and pain that he doesn't know how to share. He looks at Stella and wonders why she stays. The reader also gets to know Hugh, he doesn't seem to be connected to the story, but Rowan Coleman gradually and expertly interweaves his narrative with Stella's, so creating a turning-point in Stella's life, and affecting Hugh and his mother profoundly too. Dying, death, end of life, passing away; whatever you choose to call it, it will come to us all. It may be quick and unexpected, or drawn out and painful. It may happen too early, or tragically; whatever happens, the effect of death on everyone involved is enormous, and possibly one of the most difficult things that people have to deal with. We Are All Made of Stars is a sensitive look at the subject of dying. Rowan Coleman writes with tenderness and care, and some humour. Her characters are an eclectic bunch and painfully real, the reader will grow to love each and every one of them, The author treats the subject matter with respect and dignity, whilst still managing to captivate the reader during a story that is so rewarding. Told in her distinctive style; We Are All Made of Stars is another triumph from Rowan Coleman. Existing fans will adore it, and readers who are new to her work will be spellbound. Het idee van dit boek was erg mooi. Ik zat ook echt wel een paar keer met vochtige ogen. De rol van de kat was een mooi extraatje. Maar toch heb ik het maar 3* gegeven, want ik vond het kwalitatief niet geweldig. Dit alles bij elkaar maakt dat ik het écht geen 4* Het idee van dit boek was erg mooi. Ik zat ook echt wel een paar keer met vochtige ogen. De rol van de kat was een mooi extraatje. Maar toch heb ik het maar 3* gegeven, want ik vond het kwalitatief niet geweldig. Omg I loved this! So sad yet so sweet and funny. I listened to this as I walked to and from work and at one point I’d be laughing and other times I’d almost be at tears, screwing up my face — I bet the people driving past thought I was a right weirdo. When they are facing their last moments on earth people want to put all their affairs in order. Hospice nurse, Stella, helps her patients by penning their words into letters and making sure those words get to the appointed person. It brings peace and some comfort. Stella, herself, has no such closure when it comes to her own life. Every day, she and her wounded war veteran husband grow further and further apart. But Stella is not the only one trying to find her way, the book also spotlights a tw When they are facing their last moments on earth people want to put all their affairs in order. Hospice nurse, Stella, helps her patients by penning their words into letters and making sure those words get to the appointed person. It brings peace and some comfort. Stella, herself, has no such closure when it comes to her own life. Every day, she and her wounded war veteran husband grow further and further apart. But Stella is not the only one trying to find her way, the book also spotlights a twenty year old girl, Hope, who has Cystic Fibrosis and is recovering from her last bout at Stella's facility, and then there is lonely Hugh, who lives in the nearby neighborhood. This book which focuses on people associated with a hospice care center could be sorrowing and depressing, but this gifted author has turned the focus from dying to living. Separate lives connected by a place and life's circumstances are told with tenderness and depth. There are a few tears, moments of reflection, anguish, but humor and joy, too. A truly impactive story that will stick with me for a while. The book is formatted with three narrators: Stella, Hope, and Hugh. All seem separate stories until they cross paths, connect, and stay connected. Between their chapters of narration, the author has tucked the letters that Stella wrote for her patients making this a combination of narration and epistolary storytelling. As I noted earlier, the tone of this book is uplifting even if there is conflict in the lives of each of the narrators. Stella loves her husband dearly, but he came back from the war losing more than just his leg. Vincent claims to no longer love her. With Hope, she knows that her predicted expiration date is sooner than other people's so she has chosen to withdraw from life even though her best bud, Ben does his level best to drag her out into the light and be spontaneous. Hugh has lost both parents and has isolated himself convinced that he is living the charmed life of a bachelor until the loneliness is exposed by the boy and his mom next door. The author tucks in a different romance opportunity for each of her protagonists: second chance for Stella, first love for Hope, and a mature love for Hugh. The three main characters are colorful and different. Stella is a surface of calm and competence, but underneath she is worn out and hurting at her husband's rejection. Hope is youthful and naive, but full of sass and sarcasm as she copes with the life fate handed her. Hugh is stodgy before his time and has trouble connecting to the world around him. The handling of the hospice setting is done well. The author obviously did her homework about just such a private facility and the staff who work there. She also handled Hope's CF disease, Vincent's visible and not so visible injuries, and Hugh's losses with care and dignity as well as knowledge. Incidentally, the cat character was a total scene-stealer. Jake aka Ninja aka Shadow was a rascal. All in all, this is a thoughtful, heartwarming read that I recommend heartily. Was für eine tolle Geschichte >>> Erzählt aus verschiedenen Perspektiven und mit Charakteren die einem sofort ans Herz wachsen! Traurig und lebensbejahend in einem! Ganz wunderbar fand ich die verschiedenen Briefe von Verstorbenen, welche zwischen den Kapiteln abgedruckt waren. Das war zum Schmunzeln und Weinen, aber vor allem auch Nachdenken! Toen dit boek voor het eerst in de winkels lag trok de voorkant mijn aandacht. Ik vond het een fleurige voorkant. Vanwege die reden las ik de achterkant van het boek. Het leek mij een heel mooi boek, maar ondanks dat wilde ik toch nog even wachten totdat het goedkoper was. In januari 2017 las ik op de chat van een Goodreadsgroep dat dit het boek van de Libelle Bookazine van deze maand was. Diezelfde dag ging ik naar de Bruna en kocht ik de bookazine. Voor drie euro een heel boek, daar kon ik het Toen dit boek voor het eerst in de winkels lag trok de voorkant mijn aandacht. Ik vond het een fleurige voorkant. Vanwege die reden las ik de achterkant van het boek. Het leek mij een heel mooi boek, maar ondanks dat wilde ik toch nog even wachten totdat het goedkoper was. In januari 2017 las ik op de chat van een Goodreadsgroep dat dit het boek van de Libelle Bookazine van deze maand was. Diezelfde dag ging ik naar de Bruna en kocht ik de bookazine. Voor drie euro een heel boek, daar kon ik het niet voor laten liggen. Het duurde alleen nog een paar dagen voordat ik er in begon. Aan het begin van het boek moest ik even inkomen. Ik had namelijk niet verwacht dat je tijdens het lezen zou wisselen van personage. Hierdoor moest ik vaak omschakelen en daardoor duurde het wat langer voordat ik het had gelezen. De schrijfstijl in dit boek leest vlot weg, wat ik helaas wel tegenkwam waren een aantal spellingfouten. Hierdoor las het soms wat moeilijker. Gelukkig zaten er niet veel spellingfouten in en heb ik dit boek uiteindelijk met veel plezier gelezen. Dit boek is een boek met een lach en een traan. Op sommige momenten kreeg ik echt een brok in mijn keel en op andere momenten moest ik soms grinniken. Dit boek gaat niet alleen over de brieven van patiënten maar het gaat ook over een laatste kans en een nieuw begin. In dit boek lees je dat je niet moet wachten tot aan je sterfbed om een nieuwe kans te krijgen. Je moet leven zolang je nog kan. Het leven bestaat uit vallen en opstaan en soms moet je dat met moeite accepteren. Deze thema's kwamen goed terug in dit boek. Ik herkende mijzelf in sommige personages. Net als sommige personages wil ik ook meer genieten van het leven en alles eruit proberen te halen wat er in zit. Dit gebeurt vaak met vallen en opstaan en vaak moet ik over een drempel heen stappen om te komen waar ik wil zijn. Ik denk dat iedereen zich wel kan herkennen in de personages uit dit boek. Iedereen leeft wel met twijfels en hoopt op een nieuwe kans. Het is een leuk boek met een bijzonder verhaal. Nooit eerder had ik een boek gelezen dat werd vormgegeven door brieven. Echter vond ik de brieven soms van weinig toegevoegde waarde. De brief van Graca aan haar zoon is natuurlijk wel van groot belang en zo zijn er meer, maar veel brieven vond ik meer 'opvulling' dan toevoeging. De karakters in het boek vond ik wel erg hoed beschreven. Door het lezen heb ik een duidelijk beeld gekregen van hoe Stella, Hugh, Hope maar ook Grace, Vincent, Issy en zelfs Jake zijn. Rowan Coleman lives with her husband, and five children in a very full house in Hertfordshire. She juggles writing novels with raising her family which includes a very lively set of toddler twins whose main hobby is going in the opposite directions. When she gets the chance, Rowan enjoys sleeping, sitting and loves watching films; she is also attempting to learn how to bake. Rowan would like to liv Rowan Coleman lives with her husband, and five children in a very full house in Hertfordshire. She juggles writing novels with raising her family which includes a very lively set of toddler twins whose main hobby is going in the opposite directions. When she gets the chance, Rowan enjoys sleeping, sitting and loves watching films; she is also attempting to learn how to bake. “Do not miss me, because I will always be with you. In every drop of rain that touches your tongue, in every breath of air you inhale. In the tips of the leaves that you brush with your fingertips as you pass by. I will be there, in every moment. I am not gone, I am only altered, from this state of matter to another. For a moment, for too brief a moment, I was the man that loved you, but now that I am changed, I am the air, the moon, the stars. For we are all made of stars, my beloved. You and I, and all of life, we were all born out of the death of a star, millions of billions of years ago. A star that lived long and then, before its death, burned at its brightest, its fiercest - an enflaming supernova. But when it died, it did not cease to exist; instead everything it was made of became part of the universe once again, and everything that is part of the universe will once more become part of us. So do not miss me, because I do not die; I transform - into the wind in the tops of the trees, the wave on the ocean, the pebbles under your foot, the dust on your bookshelves, the midnight sky.